Scientists worldwide have worked for years to come up with a convincing meat substitute. Whether it's farmed with soy or synthesized from stem cells, if it tastes real, it will change the world. But not even a $1 million prize has been enough to make it happen—on Wednesday, with less than a week to spare, the deadline for a PETA-sponsored contest to create in vitro meat was extended until 2013. What's the problem? The quest to find a satisfying substitute has become an obsession among guys like me—I'm a vegetarian, but I love the taste of meat, and in the eight years since I stopped eating it, I've sought out as many red meat, poultry, and fish reproductions as I could find. I've tried Tofurky roasts, soy-rizo breakfast burritos, seitan gyros, and fake duck at myriad Thai restaurants. I've had my face and fingers slick with vegan sloppy Joe sauce. So far, the difference between fake and real meat has been obvious. But there are several reasons to believe that might soon change. To be sure, there have been some profoundly unappetizing and backwards fake meat solutions. First, there was cloned meat, and then, Japanese scientist Mitsuyuki Ikeda, came up with a way to make artificial meat from human waste. Good luck getting anyone to eat shitburgers. Just as hope faded for fake-meat enthusiasts, Fu-Hung Hsieh, a biological engineering professor at the University of Missouri, emerged with a breakthrough. After about a decade of research, in 2010, Hsieh and his colleagues created what is now hailed as the best meat substitute ever, and not because of the way it tastes. The challenge is the so-called mouthfeel—soy ground beef, for instance, simply doesn't crumble in a hot pan the way real ground beef does. Fake poultry doesn't shred like real poultry. At least it didn't until Hsieh came around. Hsieh's recipe, which includes ingredients like soy protein, pea protein, and carrot fiber, was purchased last year by a Maryland startup called Beyond Meat. If you're in the tech world and that name rings a bell, that's because Beyond Meat is the first food business to attract investment from Evan Williams and Biz Stone, the co-founders of Twitter. A Beyond Meat spokesperson said the company plans on introducing its fake chicken fully into the market in 2013, but for now, you can get the product in a few northern California Whole Foods stores. And how's it taste? New York Times food writer Mark Bittman gave it a shot, and he seemed quite pleased, saying, "When you take [Beyond Meat's] product, cut it up and combine it with, say, chopped tomato and lettuce and mayonnaise with some seasoning in it, and wrap it in a burrito, you won't know the difference between that and chicken. I didn't, at least, and this is the kind of thing I do for a living." 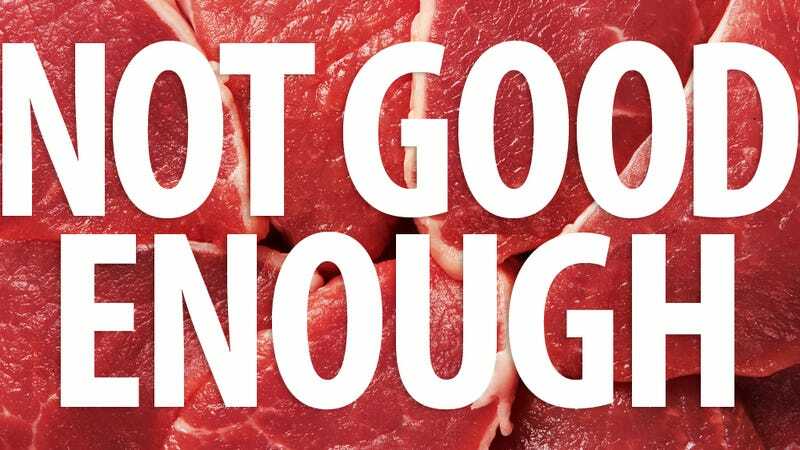 Meanwhile in Europe, scientists and food companies from Spain to the Netherlands are working on a project called LikeMeat, an attempt to produce better tasting and better textured fake meat for consumers. And at Stanford, vegan biochemistry professor Patrick Brown also believes he's hit on the next great plant-based "meat," saying at a press conference in Vancouver that he's nearing "a product that can compete head on with meat and dairy products based on taste and value for the mainstream consumer." No matter how much hard work scientists put in at countless labs around the world, there will always be those who contend that they can tell the difference between fake meat and real meat regardless of whether some fancy New York foodie says he can‘t. My father does this, and at Thanksgiving he calls my Tofurky "rabbit food." For these people, other scientists are busy devising a way to conjure real meat out of thin air, sans any farming, pollution, or bloodletting whatsoever. Animal-rights group PETA put forth an offer in 2008: It would give a $1 million prize to anyone who could create and bring to market in vitro meat by June 30, 2012. With a little less than a week to spare, PETA extended the deadline for the contest to 2013, to give more time to several labs doing promising work. Andras Forgacs, CEO of a group called Modern Meadow, is the first North American scientist to produce a tissue-engineered meat product. In February, the Los Angeles Times reported that an anonymous private investor put up more than $300,000 to support another project, led by Mark Post, chairman of physiology at Maastricht University in the Netherlands. Post and his team take pig stem cells and place them into a fetal cow serum, allowing the cells to grow into muscle tissue. The scientists then build that muscle tissue via mechanical tension and electrical shocks, increasing its volume by several hundred percent. The team hopes to have a prototype burger patty by October. The very thought of harvesting meat in labs might make many people dry heave before digging into a pork chop. But if you can get past the initial revulsion, the benefits of having plentiful and good meat substitutes are hard to ignore. Imagine a world in which scientists could create steaks that tasted like beef but were also infused with the omega-3 fatty acids prevalent in fish. Or one in which children in third-world countries could enjoy the protein-dense meals kids in the West eat. With fake meat, Post says, make meat production could require 40 percent less energy than it does now. That energy reduction figure should stand out to anyone who simply refuses to give up real meat. It's true that a person should, in most circumstances, be allowed to eat what they want. But a growing body of research shows that eating meat is hardly a personal choice anymore. Perhaps it once was. But today, when the vast majority of meat comes from energy-guzzling, environmentally damaging, downright cruel factory farms, eating meat in modern America amounts to a personal choice the same way smoking on airplanes used to be a personal choice. Sure, you can do it, but you're also screwing everyone else. Developing a technology to convincingly imitate meat benefits everyone—because really, deep down, who doesn't love a cheeseburger?